___________16. If the dimensions of a square change in such a manner that the area remains constant, what must happen to the other side if one side will be increased by 1/4 of itself? ___________17. A man rowed 4 miles upstream for 2 hours. If the river flowed with a current of 2 miles per hour, how long did the man's return trip take? ___________18. The rectangle shown in the figure is divided into 6 equal squares. 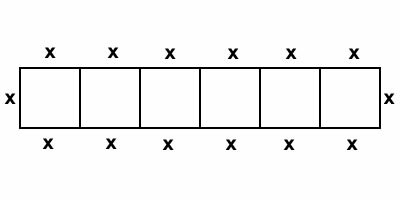 If the perimeter of the rectangle is 42 cm, what is the area of each square in cm2 ?